Skeletons are the reanimated bones of the dead. They are often found with Draugr in crypts and ruins, and may also be summoned by necromancers in combat. They are fully resistant to poison and paralysis and have a 25% resistance to frost, but, given their low health level and poor equipment, they are vulnerable to other types of attack, making them relatively easy opponents. Skeleton mages can also appear in some locations— these are leveled and have the same spell selection as Draugr spell-casters. 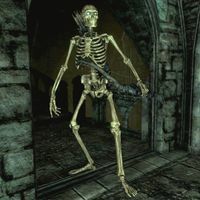 Several new skeleton variants are added by the Dawnguard add-on, many of which are very similar to draugr enemies in both their abilities and appearance. Some are even capable of using shouts. Skeletons do not have magicka, despite some being mages. This page was last modified on 18 November 2016, at 18:34.